After an amazingly full life of 94 years 356 days, my darling grandmother passed away earlier this month. Since this August 15th was to have been her 95th birthday (a milestone any way you look at it), we planned a celebration for her in Freeport, Illinois - her hometown for all of those years. In addition to the little partay the family planned, I designed a shawl for her - a pi (circular) shawl to be named Perseid Shower in her honor, since her birthday always comes at the end of the annual meteor shower of the same name. It has a variety of leafy and starry motifs that take you out from under the shelter of a tree to a starry, meteor-filled sky. So, this shawl. I cast on at the beginning of July (once we were up in Maine) and immediately had problems. My second chart was wrong, but I didn't realize this until I completed the second repeat. I got frustrated, put the shawl in timeout, knowing I had lots of time until mid-August, and cast on a sweater (more on that later). Fast-forward a couple of weeks, and I know I need to get this show on the road. The charts are revised, and I'm ready to go. Things go pretty well until just after the last increase, when I discover that I'm off by a stitch at the end of the round. Ack! This is when I have 576 stitches on the needle. Five hundred seventy-six. And the yarn is the super-thin and super-duper sproingy Jade Sapphire Lacy Lamb. And the stitches to be tinked alternate between sl1-k2tog-psso and sl2-k1-p2sso. Impossible. Just maddeningly, frighteningly impossible. If you manage to discern the slipped stitch(es), it might work. But the yarn is so fine and sproingy that you're more likely to have stitches slip off the needles and bounce out of the row below. Suddenly you have runners into some pretty complicated lace. Did I use lifelines? Of course not, because I'm an idiot. But after tinking back what seemed like hours, leaving a raft of coil-less safety pins in dropped stitches in my wake (and only a small fraction of the stitches tinked), I knew something had to be done. So, I bought a gigantic cone of crochet cotton, laid the poor shawl out, stretching it onto two needles, and wove the thread through the last two increase rounds (the inner round was for "insurance" in case something went horribly wrong again). It didn't take as long as I thought it might, and I started to feel better immediately. I also realized that my plan for which lace pattern to use after the last increase needed to change - this whole thing had been Fate/God/Karma/What-You-Will's way of saying I'd made the wrong decision when waffling over the plan at the 576 stage. OK, OK, I'm listening! That was Wednesday, August 4th, and I spent that Knit Night ripping back to the lifeline and putting the stitches back on the needle. And I have to say I'm pretty proud of my lifeline weaving - I managed to weave all the stitches in the correct row (it helps that it was the increase row: yo, k1 all the way around). I started the new lace plan on those stitches and persevered, knowing I had a car ride from Maine to NYC to put a big dent in the last section before the border and then a few more days for border knitting before blocking needed to happen; I knew such fine yarn would block in a matter of hours. Unfortunately, that Friday was a flurry of phone calls and messages about my grandmother. She was short of breath and taken to the emergency room. She was admitted to the hospital with fluid in her lungs. They had eased that situation and she was resting, then sleeping, then restless. And, suddenly, she was gone. Honestly, we were all surprised. She had pulled through many things before; she was a tiny lady by the end of her days (under five feet, though she was half a foot taller in the prime of life - eat your yogurt and take your calcium, ladies), suffering through fractured vertebrae due to osteoporosis, but she was so strong, such a force to be reckoned with that I think we thought she would always conquer whatever health problems arose. She was gone, and we had to get back from Maine to New York and then out to Northwest Illinois to say goodbye. I worked some more on the shawl on the drive back to New York, thinking I would give it to my aunt or just hold onto it. But the wind had gone out of my sails. It sat in my bag on the plane, and in the car, and on our annual family trip to Wisconsin. It's sitting in there, still. I'll take it out at some point, but it's going to be a while, I think. 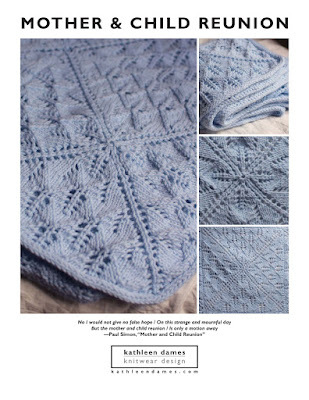 There's more going on knitting-wise, and I promise to blog about that "real soon now". In the meantime, if you still have your grandparents in your life, give them a call or stop by if you're lucky enough to live close.